Tomorrow (Saturday, Aug. 18) is National Honey Bee Day. A small group of beekeepers originated the observance back in 2009 to spotlight bees and beekeeping. They petitioned and obtained a proclamation from the U.S. Department of Agriculture, which set aside the fourth Saturday of August to mark the occasion. It's important to educate the public--especially children, our next generation--about the importance of honey bees and other pollinators. 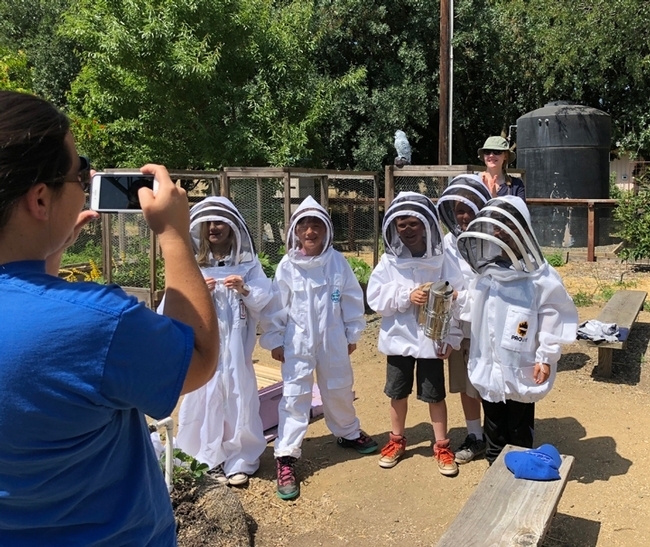 And that's just what the UC Davis Pollination Education Program is doing, thanks to California State Extension apiculturist and faculty member Elina Lastro Niño of the UC Davis Department of Entomology and Nematology. 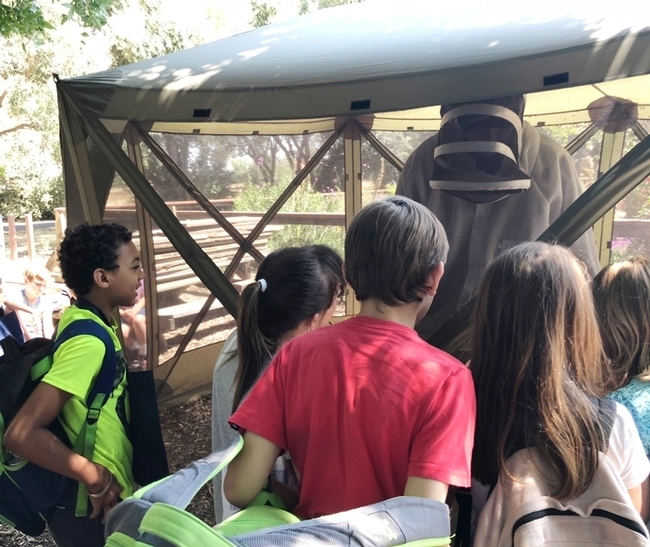 We recently watched a group of third graders from Amador County learn about honey bees and other pollinators when Nino and her colleagues hosted the youngsters in the Department of Entomology and Nematology's bee garden, the Häagen-Dazs Honey Bee Haven. A half-acre public garden installed in 2009 on Bee Biology Road, west of the central campus, it provided the perfect place for the five interactive learning stations. Postdoctoral scholar Laura Brutscher of the Niño lab kneels by an educational beekeeping display: a beehive, a smoker, a hive tool and beekeeper protective gear. 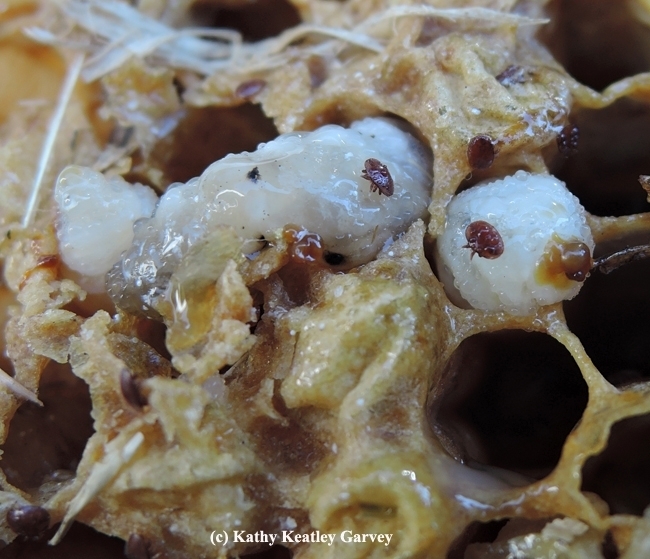 She discusses the residents of the hive: the queen, worker bees (females) and drones (males). The third-graders, sitting, standing or kneeling in the garden, listen to her wide-eyed. “Who knows what the job of a drone is?” Brutscher asks. A hand shoots up. “The drones protect the queen!” a boy declares. The students learn that the honey bee colony is a matriarchal society. 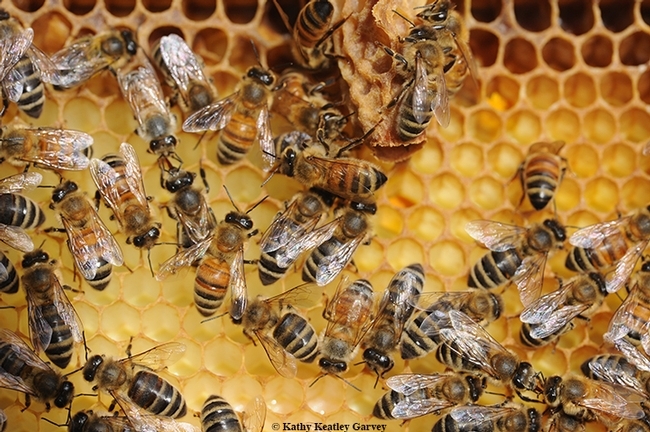 The females do all the work, performing specific tasks with job titles such as nurse maids, nannies, royal attendants, builders, architects, foragers, dancers, honey tenders, pollen packers, propolis or "glue" specialists, air conditioning and heating technicians, guards, and undertakers. The queen can lay up to 2000 eggs a day during peak season. The third graders then suit up, donning assorted beekeeper protective gear. They pose gleefully in oversized suits while adults on the tour--teachers, parents and mentors--photograph them. 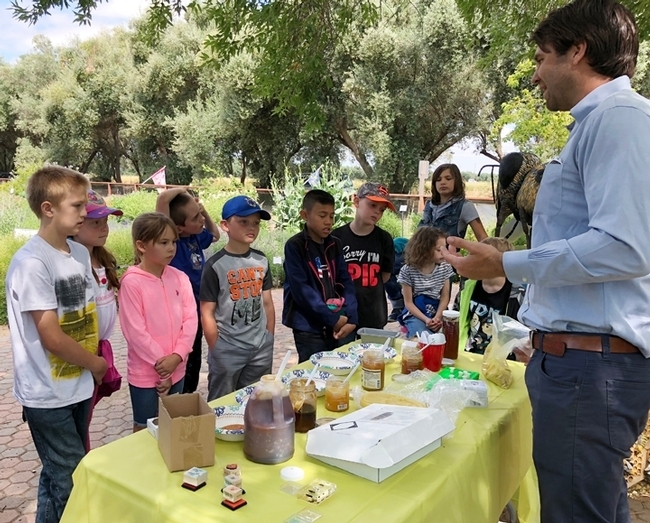 Niño, who also directs the highly successful California Master Beekeeper Program, explains pollination and how honey bees differ from such generalists as bumble bees and such specialists as squash bees. She invites the students to build their own bee, using pipe cleaners of various lengths to mimic how they are able to pollinate flowers. The youngsters also taste apples, blueberries and almonds. Honey bees, she tells them, pollinate one third of the food we eat. Charley Nye, beekeeper and manager of the Harry H. Laidlaw Jr. Honey Bee Research Facility, zeroes in on the products of the hive. “When we see bees flying around, what are they doing there?” he asks. “They're out gathering nectar and pollen,” responds one youngster. “That's right,” Nye says. He then introduces them to five varietals of honey: almond, coffee, cotton, blackberry, meadowfoam. The students and adults like the meadowfoam the best. “It tastes like cotton candy!” one girl says, slowly savoring the flavor she found reminiscent of a county fair. 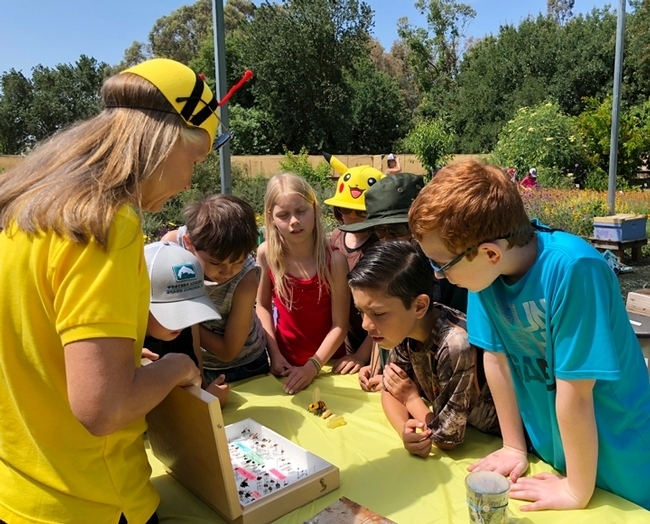 Wendy Mather, California Master Beekeeper Program manager, shows the youngsters a bee vacuum device and how to catch and release bees. They examine them close-up. Others at her interactive learning station craft seed cookies, decorated pots, and planted seeds for pollinators. They also view the bee and syrphid (hover) fly specimens loaned by pollination ecologist Neal Williams, UC Davis professor of entomology. The hover fly, sometimes called a flower fly, is a major pollinator. 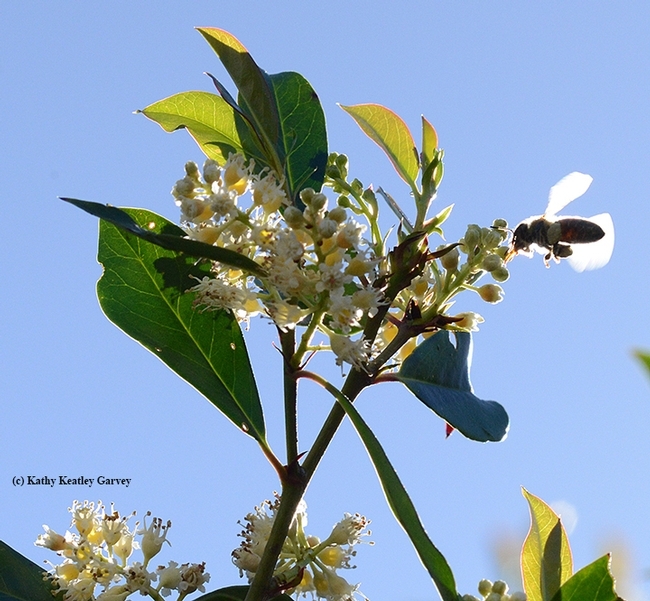 Another station focuses on solitary bees: leafcutter bees and blue orchard bees. The students paint nest boxes and learn how the native bees differ from honey bees. Honey bees are not natives of America; European colonists brought them to Jamestown, Virginia, in 1622. Honey bees did not arrive in California until 1853, the year a beekeeper installed colonies near San Jose. Marcel Ramos, lab assistant in the Elina Niño lab, opens a hive inside a netted enclosure and showed the students the queen bee, workers and drones and pulled out frames of honey. It was indeed, a honey of a day, and the youngsters learned a lot about bees. 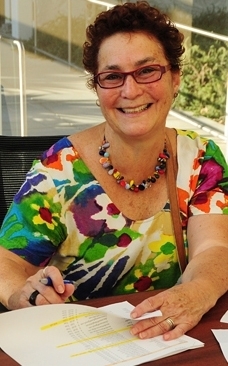 The event received financial support from the UC Davis College of Agricultural and Environmental Sciences Programmatic Initiative Grant, the Scott and Liberty Munson Family, and matching funds from Microsoft. 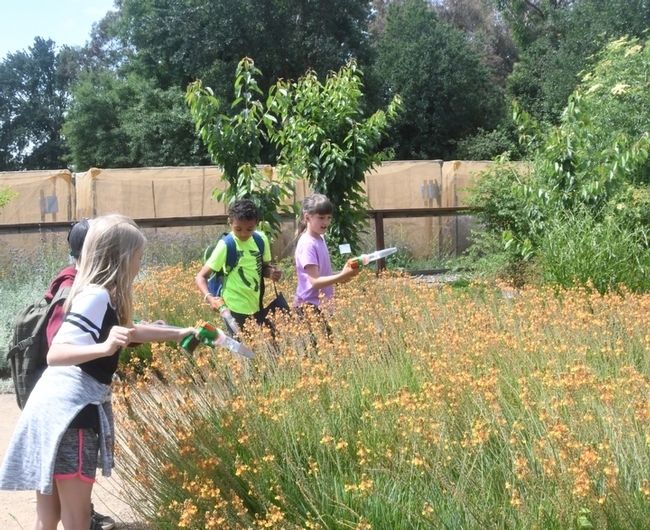 Ron Antone, chair of the Farms of Amador and an Amador County Master Gardener, coordinated the Amador County visit, which drew third-graders from four schools: 67 from Plymouth and Sutter Creek elementary and "about the same number" from Pioneer and Pine Grove elementary. 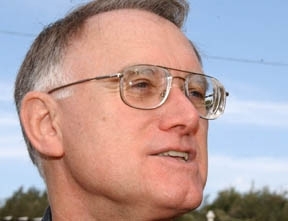 “The tour was coordinated and funded by Farms of Amador,” he said. “We are also associated with the Amador County Farmers Market Association." 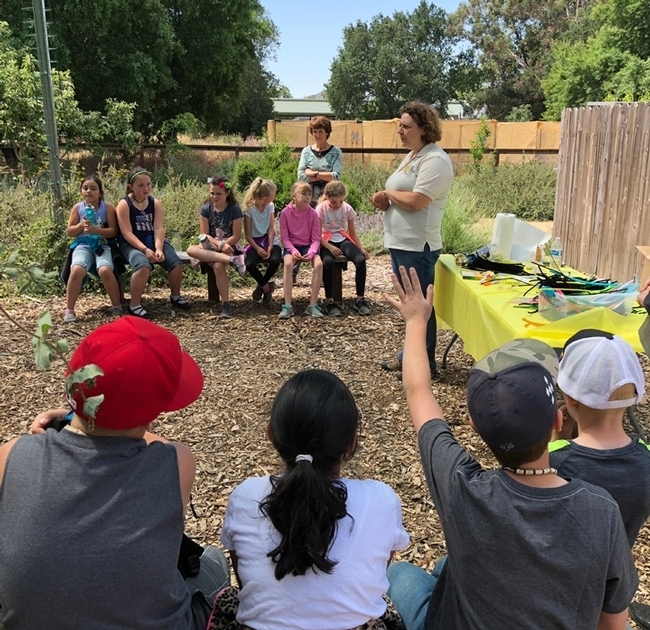 “The program presented by Elina and the Häagen-Dazs Honey Bee Haven team was an incredible experience for all involved: students, parents, teachers and mentors from Farms of Amador and Amador County Master Gardeners," Antone said. “I could not have imagined a more successful trip." 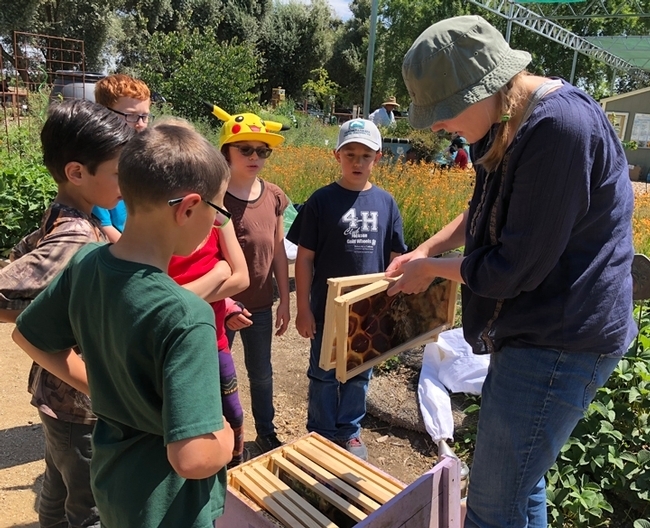 Celebrate bees on Saturday, Aug. 18: The UC Davis Department of Entomology and Nematology's bee garden, the Häagen-Dazs Honey Bee Haven, has scheduled an open house from 10 a.m. to 4 p.m., Saturday, Aug. 18. Saturday is National Honey Bee Day. The event is free and family friendly. The garden is located on Bee Biology Road, west of the central campus. Take it from the bee scientists. Honey is NOT vomit. We asked noted honey bee guru Eric Mussen, Extension apiculturist emeritus at the University of California, Davis, whose career in bee education spans four decades, to settle the issue. Although he retired in 2014, he keeps active. Last year he completed a term--his sixth--as president of the Western Apicultural Society. He maintains an office in Briggs Hall. And he continues to answer questions about bees and honey. “As for the bees and vomit issue, the explanation requires quite a bit of knowledge,” Mussen says. It's about an "expandable pouch called 'the honey stomach' (which we humans do not have) and a valve called the "proventriculus" (which we humans do not have)." Which begs the question: Why can't we enjoy honey for what it is, not for what it isn't? We can. Mark your calendar to attend these two events: the second annual California Honey Festival on May 5 in downtown Woodland (it's held in partnership with the UC Davis Honey and Pollination Center) and the fourth annual UC Davis Bee Symposium: Keeping Bees Healthy (hosted by the Honey and Pollination Center and the UC Davis Department of Entomology and Nematology) on March 3 in the UC Davis Conference Center. The Bee Symposium will feature keynote speaker Thomas Seeley, the Horace White Professor in Biology at Cornell University, New York. Interested in beekeeping? 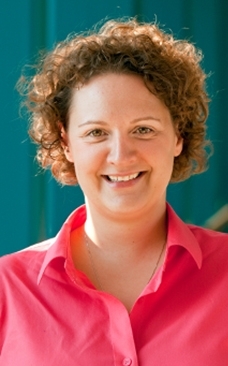 UC Davis Extension apiculturist Elina Lastro Niño and her lab will teach a number of classes this spring, beginning March 24, at the Harry H.Laidlaw Jr. Honey Bee Research Facility on Bee Biology Road, UC Davis campus. It's definitely a bee friendly plant, packed with nectar and pollen. 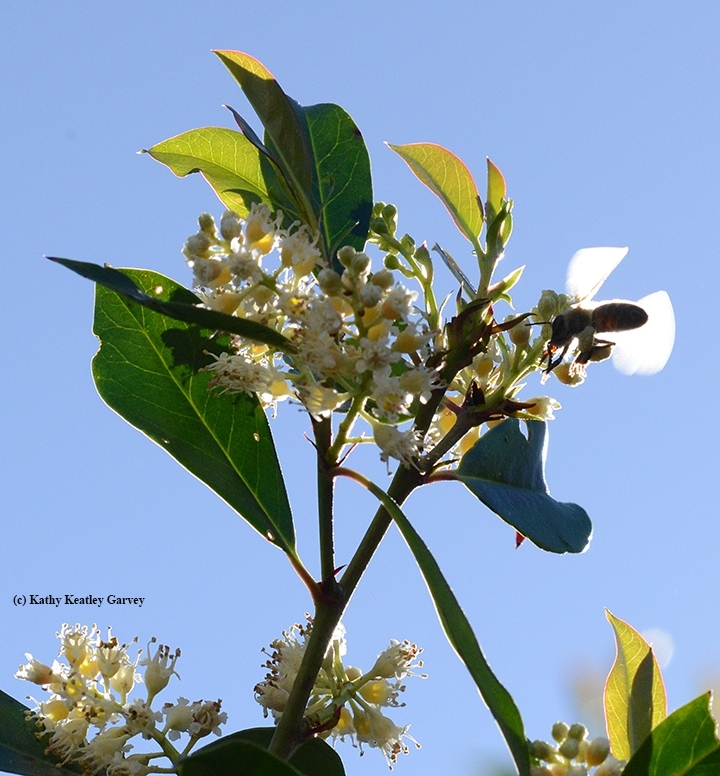 The cherry laurel, Prunus caroliniana, a member of the rose family, draws honey bees as if there's no tomorrow. Native to the southeastern United States, it can double as a 15-to-36-feet-tall hedge, screening neighbors from neighbors, as well as providing ample food for birds when the tiny black cherrylike fruit develops. But the bees...the bees...if you've ever seen bees work the spring blossoms, gathering the cream-colored pollen and the nectar to take back to their colonies, you know how frenetic they can be. 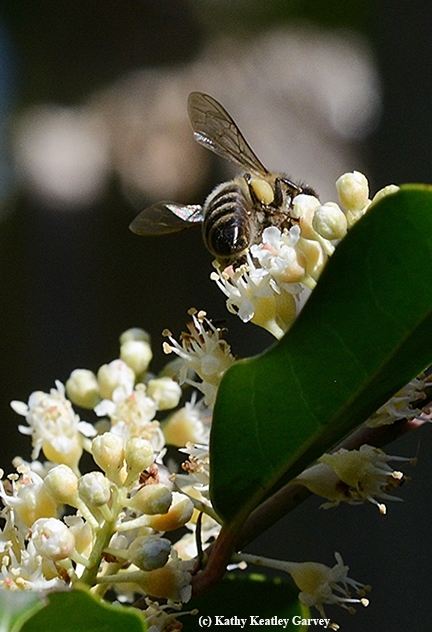 Back at the hive, the nectar turns into cherry-laurel honey....hmmm. Speaking of honey, the so-called "nectar of the gods," how much honey does an average California colony produce? California Extension apiculturist (emeritus) Eric Mussen, whose career spanned 38 years, was recently asked that question. 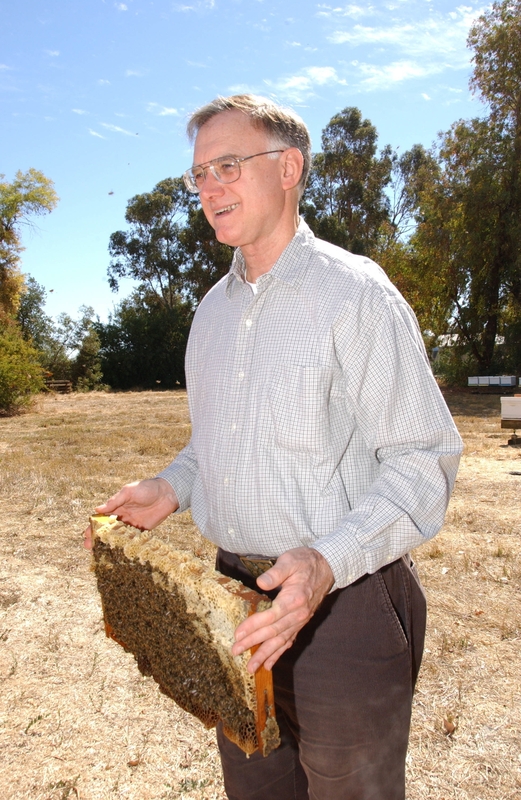 When he joined the faculty at the UC Davis Department of Entomology and Nematology--that was during the 1976-77 drought--he was told that the average honey production per hive was around 29 to 35 pounds. Today the figure often quoted is 60 pounds. "Later I learned that the 'average' honey production--years with "normal" rain--is not average across all our beekeepers," Mussen related. "The queen and bulk bee producers in northern California have never made much of any honey, especially after yellow starthistle fell victim to the USDA biocontrol program. 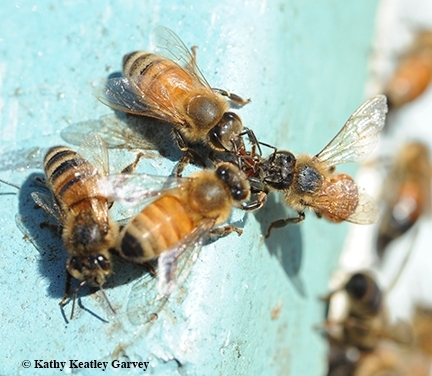 "The San Joaquin Valley beekeepers were more likely to approach the state average. They could obtain some honey from the crops they were pollinating and some from the wildflowers, especially in the hills surrounding the valley. It was the Southern California beekeepers who made up the difference. Production of 100-plus pounds could be common." 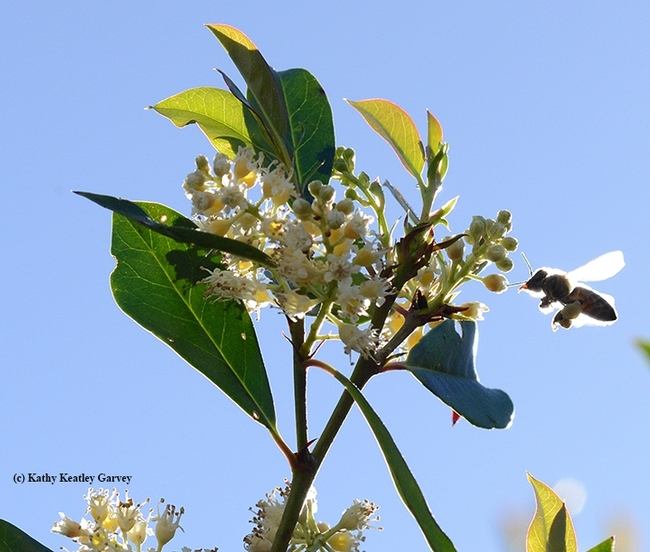 What about honey production today, in the throes of the California drought? "For the last few years, we have been having 1976-77-type crops," Mussen said. "The northern beekeepers basically have no honey unless they take their colonies out of state. The San Joaquin Valley beekeepers probably are averaging around 30 pounds or so, and the southern beekeepers would be lucky to be getting around 60." The few years when California experienced high rain and floods--back in the 1980s and 1990s--beekeepers throughout the state reported an average of 90-plus pounds per colony. 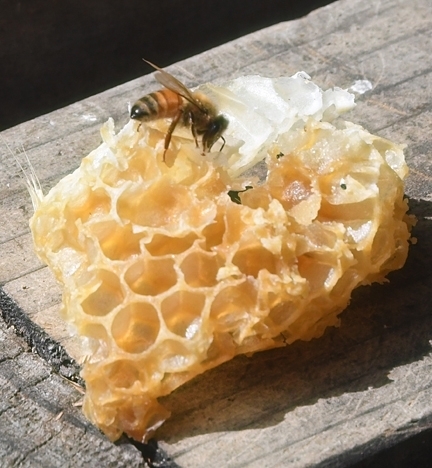 "Even the northern beekeepers produced a little," Mussen said. "However, even if we have a horrendous El Niño event, it probably won't make a huge difference in honey production this coming year. The seed bank has been terribly diminished by so many consecutive years of drought." "While we can never predict exactly who is going to get the honey and how much, this is the way things generally tend to go in California," Mussen noted. 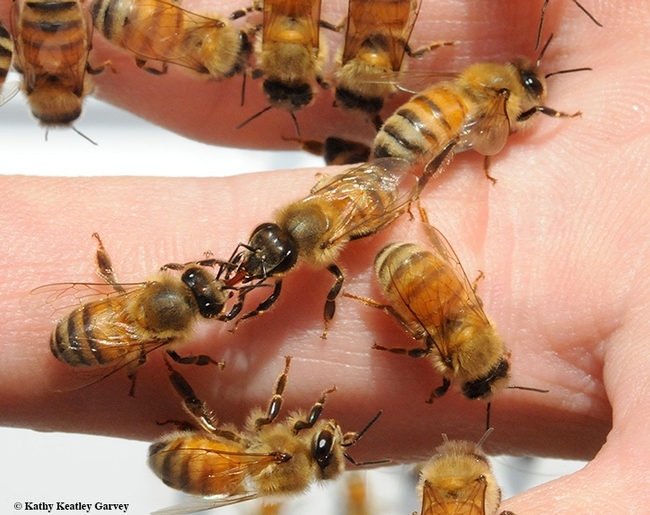 "Our bees, and our beekeepers, are really hurting for nectar and honey right now." There's not much blooming right now. But for those "lucky" honey bees with access to a 30-foot-high hedge of luxuriant cherry laurel, as in our yard, life is good. That's when life is just a bowl of cherries (cherry laurels). Would you like to know more about honey? The UC Davis Honey and Pollination Center is hosting an educational honey tasting on Wednesday night, Jan. 27 in the Sensory Theater of the Robert Mondavi Institute for Wine and Food Science on Old Davis Road. If you'd like to enroll, you need to register today (Monday, Jan. 20), To register, access this site. 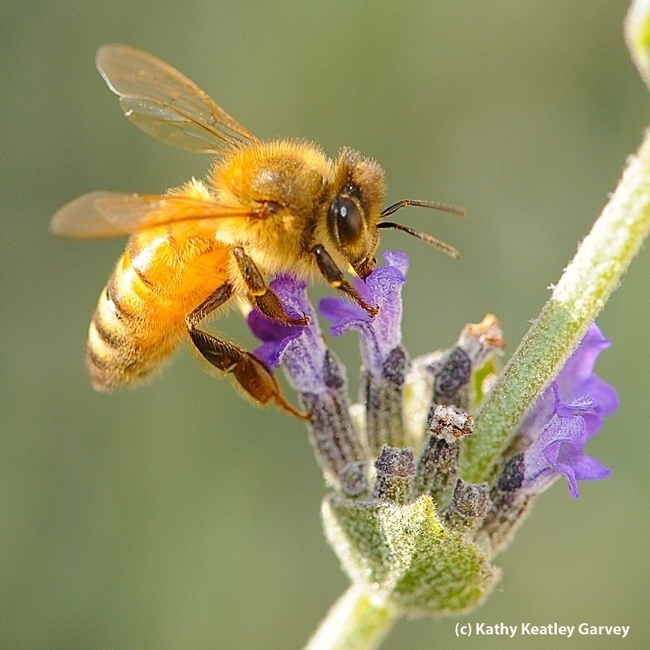 The event, conducted by Amina Harris, director of the Honey and Pollination Center, will take place from 6:30 to 8:30 p.m. and will feature California honeys. Extension apiculturist Elina Niño of the UC Davis Department of Entomology and Nematology will talk about bees, honey and beekeeping. Harris calls the event "a unique tasting experience, complemented with a short lecture delving into related beekeeping practices and issues." The cost is $30 (general), $25 (UC Davis affiliates), $12.50 (students). 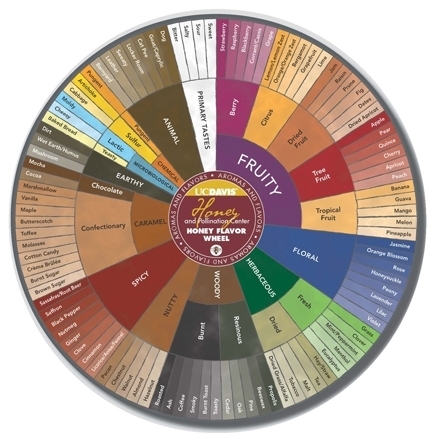 The center published a Honey Flavor Wheel in the fall of 2014 that offers tasters a way to describe honey. It is available for purchase at the center. The front of the wheel shows the descriptors, including fruity, floral, herbaceous, woody, spicy, nutty, confectionary, caramel and earthy. The back relates how to taste honey and shares four honey profiles (Florida tupelo, California orange blossom, Northwest blackberry and Midwestern clover) “ so the consumer can get an idea of how to use this innovative product,” Harris said. "Honey is honey, it's just that simple," according to the National Honey Board. "A bottle of pure honey contains the natural sweet substance produced by honey bees from the nectar of plants or secretions of living parts of plants. Nothing else." The 60,000 or so bees in a hive may "collectively travel as much as 55,000 miles and visit more than two million flowers to gather enough nectar to make just a pound of honey!" 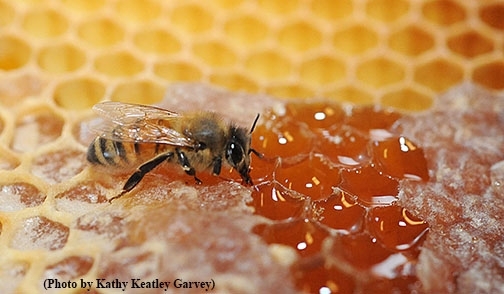 The United States is home to more than 300 unique kinds of honey, according to the National Honey Board. Among the most popular? Clover and orange blossom.